Symphony I, Symphony II. adapter to emulate of a CD changer BB´s. Switching between the adapter and original CD changer is possible! - Everything works like a real CD changer. Concert I, Concert II. - The adapter must by Connecting cables are plugged in connector on the back of your Radio easily on CD changer. Everything works like a real CD changer. - The adapter must by Connecting cables are just plugged into the CD changer jack on the back of your radio. 1 AUX AUX cable ( 3,5 mm). 1 USB / SD / AUX adapter. 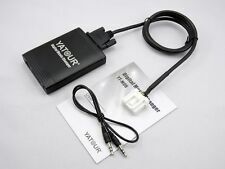 BTM(Bluetooth Adapter)=Bluetooth Adapter Need Works With Yatour M05 M06 or M07 Products. Bluetooth Adapter Can't works alone. Yatour Products Show. Becker 2234, Becker 2235, Becker 2237, Becker CDR 22, Becker CR 22,Cascade Pro. Twingo 2007 - 2011. Kangoo 2000 -. Renault RADIOSAT classic. Cabasse Auditorium (without separate CD changer). Scenic 2003-2008. LAGUNA 2001-2007. -everything works as a real CD changer. Fahrzeugmarke Renault. Renault RADIOSAT classic. Cabasse Auditorium (without separate CD changer). LAGUNA 2001-2007. -everything works as a real CD changer. Fahrzeugmarke Renault. SD/SD-HC/USB/aux/MP3 / adapter to emulate a CD Wechsler's. Adapter to emulate a CD Wechsler's. Produkttyp CD Wechsler. Produkttyp CD/DVD Wechsler. Becker 2234, 2235, 2237,2340. Compatible with all Becker radios that will work with the CD-changer "Silverstone 7860". SX4 in 2006. Grand Vitara 2006-2009. - Everything works like a real CD changer. - the adapter must by Cable simply inserted to the CD changer input on the back of your radio. 1 AUX AUX cable ( 3,5 mm). SD / SDHC / USB / Aux / MP3 / AUX IN -. Jimny (1998-2010), Grand Vitara (2006-2010), swift (2005-2010), SX4 (2006-2010). -everything works as a real CD changer. - the adapter must by cable just inserted in the CD changer input on the back of your radio. Jimny (1998-2010), Grand Vitara (2006-2010), swift (2005-2010), SX4 (2006-2010). 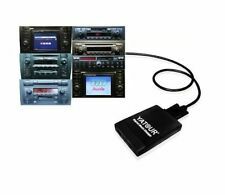 SD / SDHC / USB / Aux / MP3 / AUX IN -. -everything works as a real CD changer. - the adapter must by cable just inserted in the CD changer input on the back of your radio. RD4 Bosch / Blaupunkt. RD4 continental from 2011. VDO RD4 N1M-02 radio (P13825). Connector only fits for radio with 12-pin CD changer! Citroen C8 from 2005. Citroen C4 2005. Fahrzeugmodell C2 C3 C4 C5 C6 C8 Pluriel Picasso Berlingo Nemo. L6 Touareg / T5 Multivan. 1 AUX AUX cable ( 3,5 mm). 1 USB / SD / AUX adapter. adapter to emulate a CD Wechsler's. Switching between the adapter and original CD changer possible! USB stick to 8 GB / SD card compatible up to 32GB. CX5 from 2012. CX7 2009-2012. RX8 2010-2012. -everything works as a real CD changer. - the adapter must by cable just inserted in the CD changer input on the back of your radio. 1 AUX AUX cable ( 3,5 mm). Becker 2234, 2235, 2237,2340. Compatible with all Becker radios that will work with the CD-changer "Silverstone 7860". CR 11 / 21/22. SD / SDHC / USB / Aux / MP3 / AUX IN -. PLUG & play with Bluetooth hands-free system / adapter. Everything works like a real CD changer. - The adapter must by Connecting cables are just plugged into the CD changer jack on the back of your radio. 1 USB / SD / AUX adapter. adapter to emulate a CD Wechsler's. Adapter to emulate of a CD changer BB´s. Audi A8 1998-2004. Audi A6 1998-2004. Switching between the adapter and original CD changer is possible! Audi TT 1995-2005. - Everything works like a real CD changer. CX7 2007-2008 (Without Bose system). RX8 2004-2008 (firmware v 9.55, except V 10.01 and V 9.81). Miata / MX5 2003-2008(ohne BOSE-System). For all radio stations with and without the BOSE system (except Mazda 6 with integrated CD changer and Mazda 3 with MP3-changer). Everything works like a real CD changer. - The adapter must by Connecting cables are just plugged into the CD changer jack on the back of your radio. 1 USB / SD / AUX adapter. SD/SD-HC/USB/aux/MP3 / adapter to emulate a CD Wechsler's. RD4 Bosch / Blaupunkt. RD4 continental from 2011. VDO RD4 N1M-02 radio (P13825). Peugeot 607 2005. Peugeot 307 2005. SD / SDHC / USB / Aux / MP3 / AUX IN -. Peugeot 407 407 SW 2005. Peugeot 207 2006. Everything works as a real CD changer. - the adapter must by cable just inserted in the CD changer input on the back of your radio. 1 AUX AUX cable ( 3,5 mm). 1 USB / SD / AUX adapter. 6000CD RDS, RDS EON 6000CD, 6000 MP3, 7000 RDS, 9000VNR, MD4500. For all radio stations with and without the BOSE system (except Mazda 6 with integrated CD changer and Mazda 3 with MP3-changer). - Everything works like a real CD changer. - the adapter must by Cable simply inserted to the CD changer input on the back of your radio. Everything works as a real CD changer. -the adapter must by cable just inserted in the CD changer input on the back of your radio. 1 AUX AUX cable ( 3,5 mm). 1 USB / SD / AUX adapter. - Phone connects automatically via Bluetooth with the handsfree. 6000CD RDS, RDS EON 6000CD, 6000 MP3, 7000 RDS, 9000VNR, MD4500. Ford : 4000, 4050 RDS 4500, 4600CDR, 5000RDS, 5000RDS EON. -everything works as a real CD changer. -the adapter must by cable just inserted in the CD changer input on the back of your radio. Everything works like a real CD changer. - The adapter must by Cable simply inserted to the CD changer input on the back of your radio. 1 AUX AUX cable ( 3,5 mm). AUX input for 3,5 mm jack for audio playback. Modell YT-M06-VOL HU. Fahrzeugmodell Volvo mit HU Radios. Fahrzeugmarke VOLVO mit HU Radio. Anschlüsse USB SD AUX. Fahrzeugmarke Volvo. Wiedergabeformate MP3 WMA. Kompatible Formate MP3. Produkttyp CD Wechsler. SD / SDHC / USB / Aux / MP3 / AUX IN. Switching between the adapter and original CD changer possible! Audi A4 / S4. - Everything works like a real CD changer. - The adapter must by Connecting cables are plugged in connector on the back of your Radio easily on CD changer. MPN Yatour VW12. 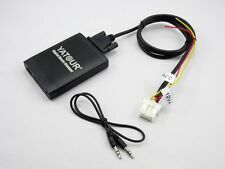 USB / SD interface for your original Volkswagen radio, Audi, Skoda, SEAT. AUX input for 3.5 mm. compatibility with MP3 and WMA files. Symphony Mp3. Formato compatible MP3. 1 x USB interface box. 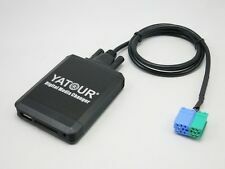 For above demands, Yatour Bluetooth car adapter (BTA) is released. Read over this instruction carefully before using Yatour. Skoda 2003-2008 Fabia, 2003-2008 Spuerb, 2003-2007 Octavia. SKODA Gamma. MPN Yatour BM4. AUX input for 3.5 mm. USB/SD interface for your original BMW radio. BMW 3-Series E46 1998-2005. BMW 5-Series E39 1995-2003. BMW 7-Series E38 1994-2001. BMW X 5 E53 1999-2006. BMW Z3 1996-2002. Suitable for Honda Goldwing GL 1800. SD / SDHC / USB / Aux / MP3 / AUX IN -. -everything works as a real CD changer. - the adapter must by cable just inserted in the CD changer input on the back of your radio. 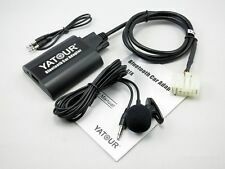 For above demands, Yatour Bluetooth car adapter (BTA) is released. Read over this instruction carefully before using Yatour. Becker 2234, Becker 2235, Becker 2237, Becker 2340 ,Becker CDR 22. 1 X Becker 14pin（blue 8 pin, green 6 pin）plug. Not Compatible with (Qashqai, X-Trail, Tiida, Note ) with 6-disc CD changer. Plug & Play: installed via original CD changer port, easy and fast, perfectly integrated with the car. This product can be compatible with NISSAN and INFINITI RADIOS. 1 X bmw 3pin 6pin plug. 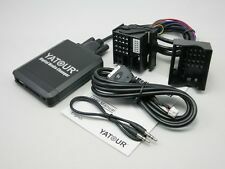 1, It requires extraDSP kit from YATOUR for BMW with Digital DSP amplifier and 3pin and coaxial output in trunk. It can be easily installed and used. 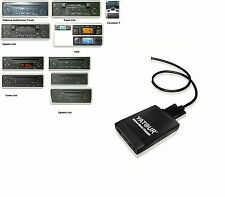 DSP KIT FOR YATOUR BMW04 DIGITAL MUSIC CHANGER / IPHONE IPOD ADAPTER. 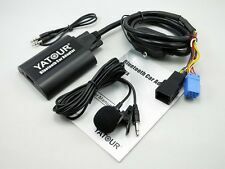 Yatour Bluetooth Car Adapter Music Kit For BMW 40Pin X3 X5 Z4 Z8 Mini R5x Headunit. Plug & Play: installed via original CD changer port, easy and fast, perfectly integrated with the car. 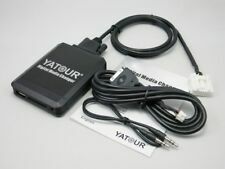 For above demands, Yatour Bluetooth car adapter (BTA) is released. 1 X VW 12pin plug. Skoda 2008-2011 Spuerb, 2007-2011 Octavia. Plug & Play: installed via original CD changer port, easy and fast, perfectly integrated with the car. 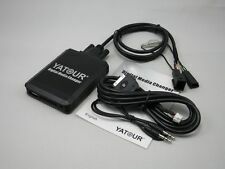 For above demands, Yatour Bluetooth car adapter (BTA) is released. 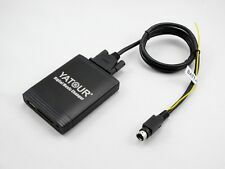 For above demands, Yatour Bluetooth car adapter (BTA) is released. Usually, the car stereo needs to be removed so as to plug BTA's main connector into CD changer port on radio back. Read over this instruction carefully before using Yatour. VW: Gamma IV. SD / SDHC / USB / Aux / MP3 / AUX IN -. -everything works as a real CD changer. - the adapter must by cable just inserted in the CD changer input on the back of your radio. 1 AUX AUX cable ( 3,5 mm). MINI R5x 2001 2006. It can be easily installed and used. BMW 5 Series E39 2000 2003 all Professional. Your car head unit should be CD changer capable. Each car use specific device. More options coming soon available for your choice. 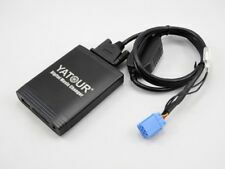 Optional Yatour Bluetooth Adapter(YT-BTM) BTM(Bluetooth Adapter)=Bluetooth Adapter Need Works With Yatour M05 M06 or M07 Products. Bluetooth Adapter Can't works alone. Yatour Products Show. Head Units Becker Becker 2234, Becker 2235, Becker 2237, Becker CDR 22, Becker CR 22,Cascade Pro. YTBTA-VW 8pin. Skoda 2003-2008 Fabia, 2003-2008 Spuerb, 2003-2007 Octavia. SKODA Gamma. Plug & Play: installed via original CD changer port, easy and fast, perfectly integrated with the car. Not work with Polo 2004 with single-disc CD radios without MP3 function, Not compatible with TravelPilot radio. Carminat 2 . CARMINAT TomTom (Tominat). Renault RADIOSAT classic. Tuner list. Fahrzeugmarke Renault. SD/SD-HC/USB/aux/MP3 / adapter to emulate a CD Wechsler's. Suitable for the following Ford factory radio.